Use this pumpkin applique on all your fall items from hats, scarves, bags to tablecloths, napkins and anywhere else where you could use a little fall festivity. The crochet applique works up quick and can be made with a small amount of leftover yarn from other projects. The finished size measures only one inch across, which makes it ideal for decorating everything in your kitchen. 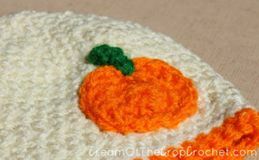 You could place a bunch of them around a table cloth, and then to match your placemats and napkins, simply stick one pumpkin applique in one or more corners as you like. For the rest of the house, try adding them to floor mats, curtains, pillows and other linens. It’s really that easy to decorate your home for the fall. ch 4, beginning at the top of the pumpkin, sc in 2nd ch from hook, sc in next st, slst in pumpkin to attach, cut yarn, fasten off, weave ends. 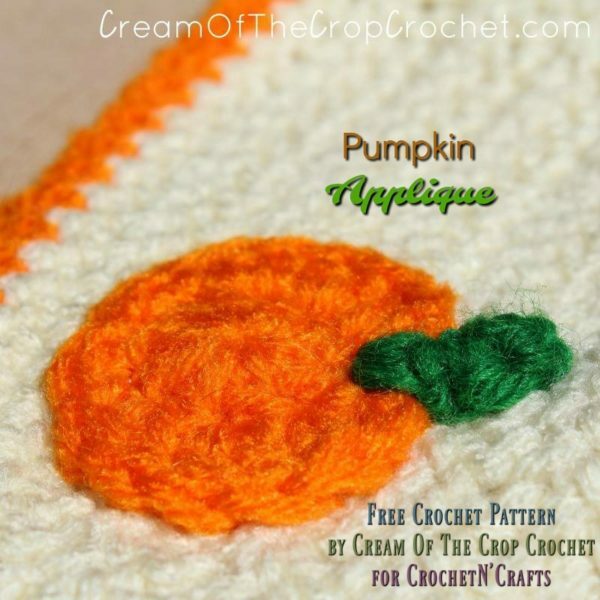 Make as many as you like, all in one color or in different shades of orange for a beautiful fall decor. Add them to bags, hats, scarves, ear warmers and headbands.